The city is also exploring ‘smart city’ applications for lighting in the capital. 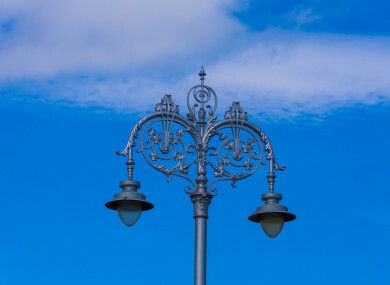 DUBLIN CITY COUNCIL is planning to re-haul public lighting around the city, replacing some 120 standard lamp posts with ‘heritage luminaires’, rolling out smart cities applications, and some ‘complementary projects’. Heritage luminaires are the “ornate columns with the scrolled brackets” seen around College Green, Merrion Square, Gardiner Street and along sections of the quays, said a council spokesperson. These are the are the seahorses, tendrils, shamrocks and crests decorating the city’s lamps and lamp posts. They’re spread throughout the capital, but mostly along the canals. The aim of the project is to “maintain and enhance” the character of heritage areas by bringing “uniformity and consistency” to the lighting infrastructure in the public realm. Different designs belong to different areas, and are named after them or their creator, like the ‘Balintine’ — the most popular — named after its company. Another popular type is the ‘Cuffe Street’ column, named – you guessed it – after the street it was first installed on. The replica structures will mostly be added where originals already exist, mixed in with standard lamps, to amplify the heritage character of these areas. This part of the upgrade is expected to take about a year to complete, according to the council. The council is also planning to replace up to 40,000 luminaires with energy efficient LED lighting, and a “significant amount” of public lighting legacy cables. On top of that, Dublin could be seeing the roll-out of a central management system to manage street lights remotely, and to facilitate smart cities applications within the capital. Right now, most of the city’s street lights aren’t remotely monitored. The authority is also considering “complementary projects” like “village centre lighting renewal schemes”, to improve lighting in urban villages, bridge lighting – including feature lighting – Christmas lighting, and building lighting. The overall project cost is about €50-€80m, as per expression of interest, though the project is only at tendering stage right now. Email “Dublin City Council is upgrading the city's lights, re-creating 'heritage luminaires' from old moulds ”. Feedback on “Dublin City Council is upgrading the city's lights, re-creating 'heritage luminaires' from old moulds ”.